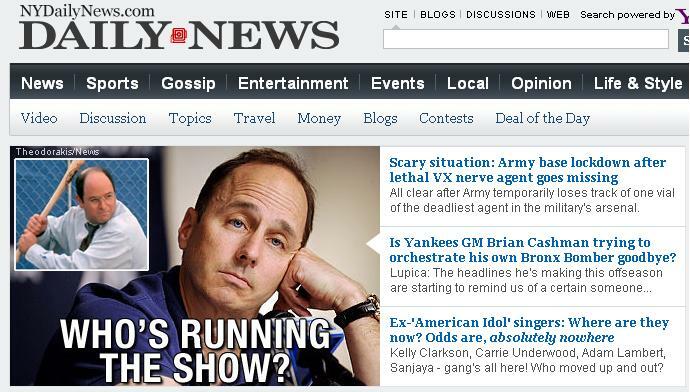 I’d always thought Brian Cashman was a terrible GM. That is until recently, when I realized that ownership was overriding him on a lot of the decisions I didn’t like. Cashman made it obvious he didn’t want to sign Rafael Soriano this offseason and when the expensive signing happened, everyone knew Hank Steinbrenner overrode his GM. As the trade deadline neared, speculation soared. Would the Yankees trade their top three prospects (Montero, Banuelos, and Bettances) for Ubaldo Jimenez? It was all over Twitter. Tweets like “If #yankees r in it to win WS this yr, why no trade using the farmhands? Isn’t that y there’re there? This could be Cashman’s last contract.” by ESEustaquio flooded the Twitterverse. The media too wanted something to happen–maybe just so it could have something to report. Despite all the pressure to get Ubaldo Jimenez and give up half the farm like the Indians did, Cashman abstained and probably restrained Hank Steinbrenner too. Despite the pressure to get Heath Bell, Cashman restrained. Despite the pressure to get Erik Bedard, Cashman restrained. Despite the pressure to make a move for the sake of making a move, Cashman restrained. There was once a President who some have called “The Great Restrainer.” He’s probably my favorite president in American history. 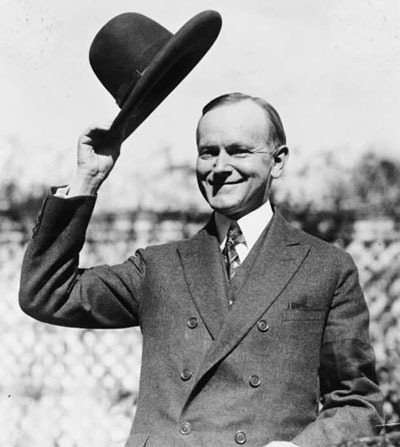 There he is…President Calvin Coolidge. Such a jolly fella. Silent Cal, they called him. He’s is pretty unknown and forgotten in American history (if you haven’t heard of him please restrain yourself from voting in 2012), and potentially best known for the college named after him in National Lampoon’s Van Wilder, Coolidge College (which by the way I think is a real college). That was just a little excerpt I found online. Coolidge served as President from ’23-’29 and cut taxes from the pre-FDR rates! Farm subsidies were proposed for the first time during his presidency and he fought them off. There was even a natural disaster in Mississippi, generally considered the worst in the history of the Gulf (until Katrina), and he didn’t visit as he claimed it would be political grandstanding (which is probably true) and he didn’t think the federal government had a role in the recovery effort, something he considered a state issue. Members of his own party were befuddled and angered by his unwillingness to use his power to further their agendas. He restrained the federal government from doing things just because they could. Benjamin Franklin once said “Never confuse motion with action.” Nowadays you see a lot of motion in Washington and little action (and very, very little beneficial action). Anyway, the point of this ridiculous and fun comparison is that both the pre-depression President, Calvin Coolidge, and the current Yankees GM and faced a lot of pressure to do something for the sake of doing something. Coolidge resisted the urge to assert and grow the power of the presidency. Brian Cashman faces pressure to make a “splash,” which to me sounds like making a move for the sake of making a move. Remember when we signed Kei Igawa just because the Red Sox got Matsuzaka? Yeah, sometimes it’s best to stay quiet, and when Hiroki Kuroda of the Dodgers refused to waive his no-trade clause, Cashman knew that time was now…so he let the trade deadline pass and let the criticism come. The bottom line — Cashman made the right call by not making a move just to appease the masses…that and Calvin Coolidge is really cool. Cashman definitely showed some discipline by not giving up any of our top prospects, but I am not totally happy about this. Cashman said after we lost to Texas last year that our #1 priority was pitching. So what does he do in the off-season? He acquires Bartolo Colon and Freddy Garcia. Now, I will laud him for these moves, because both pitchers have performed better than anyone could have expected. I just have doubts of how long they’ll keep this up. They are both old and Colon is very out-of-shape. You figure that if pitching is your #1 priority, you would make moves for players with a little more certainty. After failing to acquire anyone meeting such standards in the off-season, everyone (including myself) was thinking, “That’s OK. We’ll just get someone before the trade deadline.” Negative. If Colon and Garcia keep this up, then great. I’m just a little uneasy about the whole situation. We’re having a decent year, and the team is getting pretty old. We have a very small window left in which we will have a shot to win a World Series, so I was a little surprised that more wasn’t done for the here-and-now. And yes, I have heard of Calvin Coolidge. But he’s got nothing on the legendary James K. Polk! Yeah, I know what you mean, but we are likely going to put Hughes in the bullpen unless he has a good start tonight and we already have 5 guys after that. It’s awfully hard to not use Nova or Hughes. Nova has been good and Hughes has potential. Yankees did try to get some pitching, but nobody would take Hughes in a trade. The team is old and their window is already closed. Maybe that’s the case, and if it is they shouldn’t give up their prospects too. I wonder if Calvin Coolidge would be a libertarian by modern day standards. The social issues were non issues back then…nobody could imagine doing the things that we now debate for legality, at least that’s the impression I have. There would be nothing dumber than putting Hughes in the bullpen. It’d be Joba, Part 2. They already screwed up his career; to make the same mistake again would be beyond stupid. Obviously the Yankees’ window is not quite closed, because they have a 65-42 record and are just one game behind Boston. They are also well ahead in the wild-card standings. Yeah, I agree that the window isn’t closed, but if we have just 1 year left is it worth trading for a big time pitcher when he will only have the potential to be a key difference on a WS team for half a season? I mean if we’re going to be irrelevant after that then he doesn’t matter and I’d rather have the picks. On Hughes…if he gets shelled tonight they’re putting him in the ‘pen and I couldn’t agree more. Here’s the quote: “Right now we have a six-man rotation,” said manager Joe Girardi. “We will try and clear it up after the day off.” If Hughes isn’t good in his Tuesday start, and Nova shows something in his start on Thursday, Hughes could end up in the bullpen, where he’s thrived in the past. I guess signing Rafeal Soriano worked out in the end. He did trade Jesus Montero, but it was for another prospect, so the principle remains the same.